‘Tis the season for giving, and there is no greater gift than one you give to a child. For more than 40 years, our family-owned business has made it a priority to give back to the community, and this year our cause hits close to home. 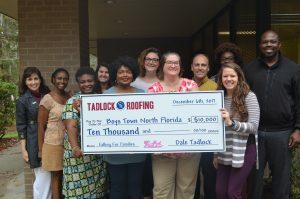 As part of our “Falling for Families” campaign, Tadlock Roofing was honored to match up to $10,000 in donations made to Boys Town North Florida on Giving Tuesday, November 28. 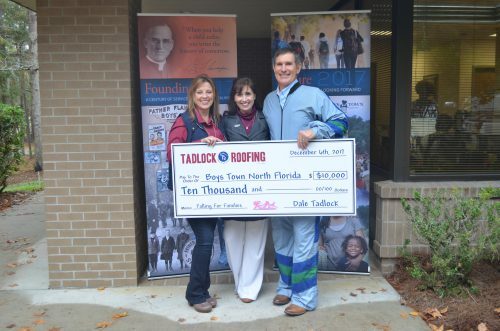 Thanks to the incredible generosity of our community supporters, Tadlock Roofing and Boys Town North Florida secured a record $20,595 in 24 hours, which included our full $10,000 pledge. My wife, Pamela, and I are blessed to have a long-standing relationship with Boys Town North Florida, which served as a resource for our family during times of need. We knew we wanted to help the organization impact more lives, just like they did ours, and that is how our “Falling for Families” campaign came to be. To put the $20,000 of donations into perspective, $500 supports one child temporarily living in the Boys Town Village for one month. With the total amount collected, including our donation match, there are now funds equivalent to supporting all 40 children living on-site for one month. We were honored to visit the Boys Town North Florida office the next week, where we had the opportunity to present Development Director Dena Strickland and the Boys Town North Florida team with the $10,000 check. 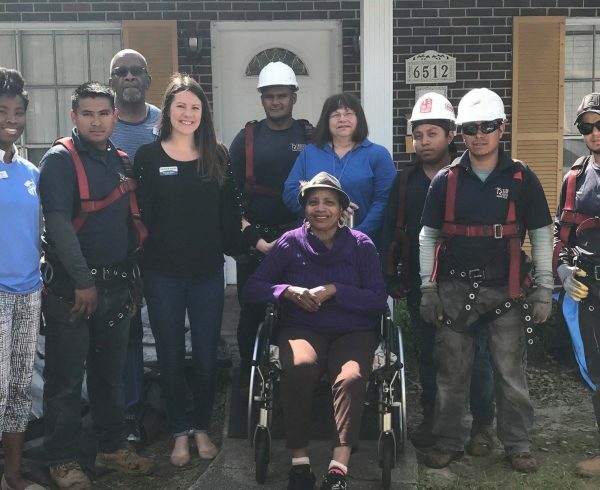 Dena, and the entire Boys Town community, thanked Tadlock Roofing for our support, which will allow their team to go above and beyond in helping children and families in our community. But, without your contributions, this gift would not have been possible. Thank you for helping us make a difference. When raising money for such a great organization, we knew we had to up the stakes. 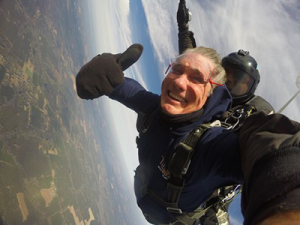 We decided the “Falling for Families” fundraising campaign would not be complete without the “falling,” aspect so I have agreed to jump out a plane (with a parachute) in January to celebrate reaching our goal. The entire Boys Town North Florida family, and some of the children they serve, will be in attendance as I fall for families – this time, literally! 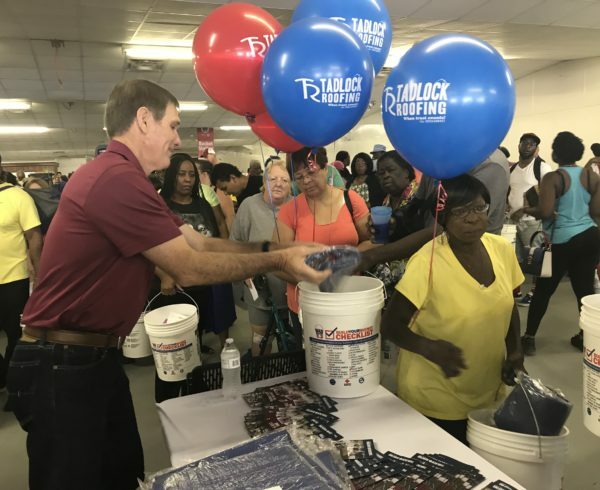 Tadlock Roofing has built its foundation over the last 40 years on making a difference in the community. We feel incredibly blessed and humbled that you helped us do so with Boys Town this holiday season. Finding a good roofer is like finding a needle in a haystack. On Nov. 21, we’re giving homeowners in Bay and Walton counties the opportunity to find both—and maybe win a brand new roof, free of charge. As a way of thanking the residents of our great community, we’re giving one lucky Bay or Walton County homeowner the chance to win a brand new roof valued up to $12,000 at our Needle in a Haystack event on Saturday, Nov. 21 from noon to 3 p.m. at the Tadlock Roofing Showroom in Panama City. All you have to do is find a needle in a haystack—literally.